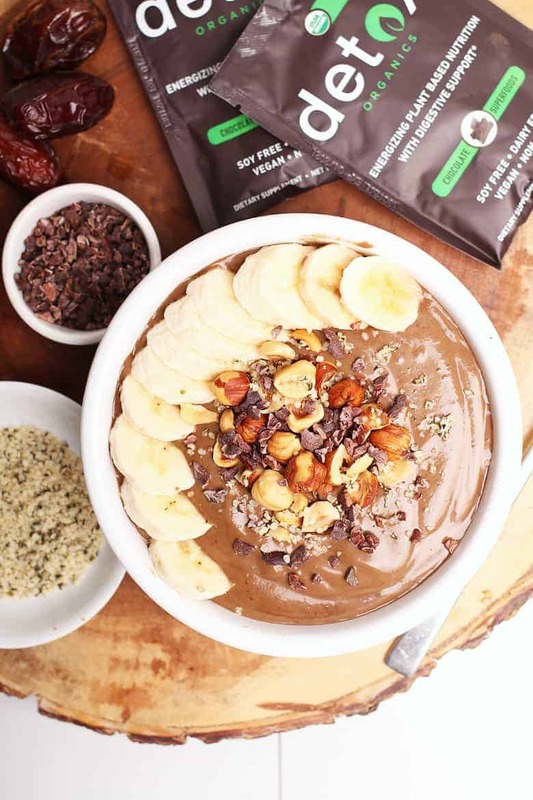 This Hazelnut Chocolate Smoothie Bowl is a wholesome, hearty, and delicious way to start your day. Made in just 5 minutes, it’s a smoothie that is packed with fiber, protein, and powerful superfoods for a meal that will fuel you up for hours. This post is sponsored by Detox Organics. All thoughts are 100% my own. I will go out on a limb and say that there are not two things that go together better than chocolate and hazelnuts. The combination is heavenly. 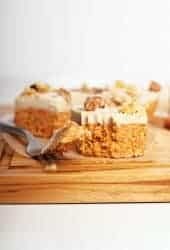 It makes for a delicious raw cheesecake or cream pie. And, of course, there’s a reason it’s everyone’s favorite sweet spread. Because it’s just so good! I hope you can agree. Because of my love for chocolate and hazelnuts, I’ve decided to create a breakfast recipe that celebrates these flavors. And I think you’re going to love it. 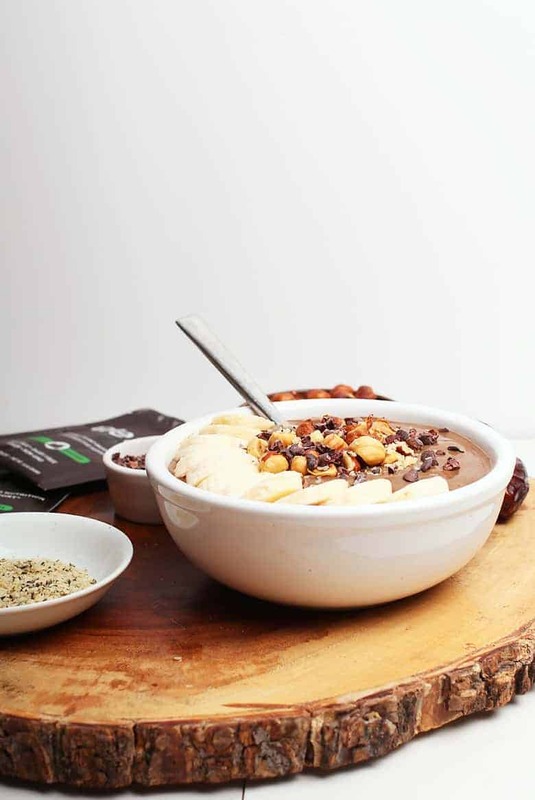 This Hazelnut Chocolate Smoothie Bowl is not only DELICIOUS, but it’s packed with beneficial superfoods, healthy fats, fiber, and protein for a wholesome meal to start your day. Let’s take a closer look at this Hazelnut Chocolate Smoothie Bowl. A smoothie bowl is a thick smoothie (think soft serve ice cream) made with a base of fruits, veggies, and other healthy mix-ins such as a variety of superfoods, supplement powders, and yogurt. Because of its thick consistency, it is served in a bowl and eaten with a spoon. Smoothie bowls are often topped with a variety of fruits, nuts, seeds, and granola. Smoothie bowls are super simple to make! To make a smoothie bowl, simply blend the ingredients together in a blender until you have a thick, creamy consistency. 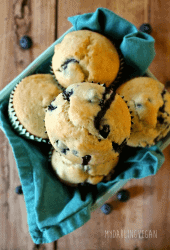 Scoop it into a bowl, add your favorite toppings, and enjoy it with a spoon! So easy! Do make sure that you are using frozen fruit at the base of your smoothie bowl. Frozen fruit provides the ice cream like texture. When smoothie bowls aren’t properly chilled, the texture can get thick and slimy. With endless variations, you can experiment with a different smoothie bowl every day for a fully satisfying breakfast. 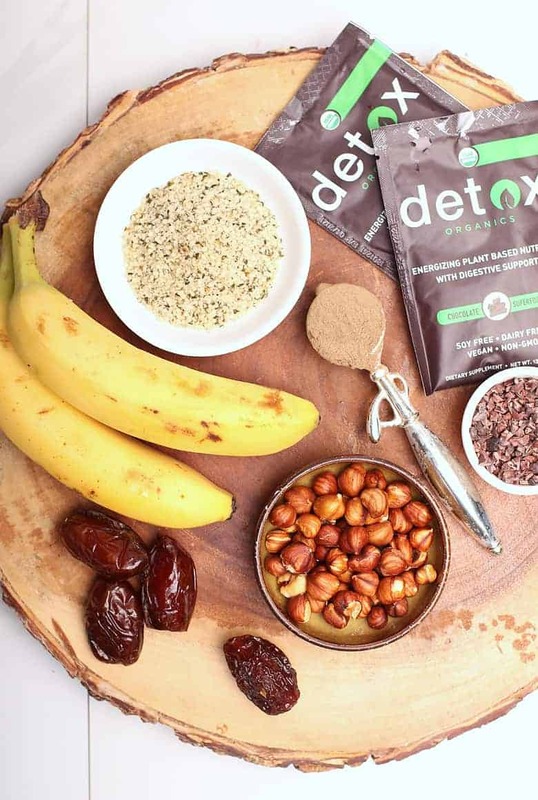 For chocolate smoothie bowls, I like to add one of my favorite dietary supplements, Detox Organics. Detox Organics is a superfood powder that works as a 3-phase supplement alkalizing and detoxifying the body while providing digestive support. This supplement removes harmful toxins, reduces inflammation, eases digestion, and supports healthy immunity – all in one delicious chocolate powder! 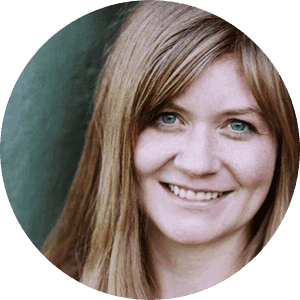 Rather than being filled with unnatural ingredients, Detox Organics works with your bodies own natural detoxification system to eliminate toxins and decrease inflammation through whole, natural, and healthy foods. That just to name a few of its many benefits! 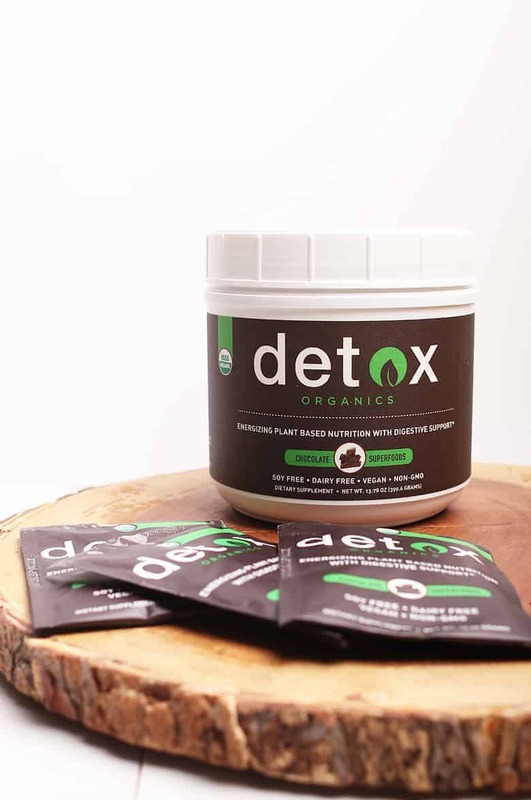 Each scoop of Detox Organics contains a powerful combination of vegetables, fruits, herbs, and plants that are raw, 100% certified organic, and vegan. And somehow, they make it delicious; a supplement powder with no grainy or weird aftertaste. It’s truly incredible! I love this product and I highly recommend you check it out. Detox Organics can be used daily in your morning smoothies or mixed with 10-12 ounces of water or your favorite non-dairy milk. Make sure your bananas are completely frozen to ensure the right ice cream-like consistency. To freeze the bananas, peel and chop ripe bananas into 1″ pieces. Freeze in a single layer on a baking sheet. When frozen all the way through transfer the banana pieces to a ziplock bag. 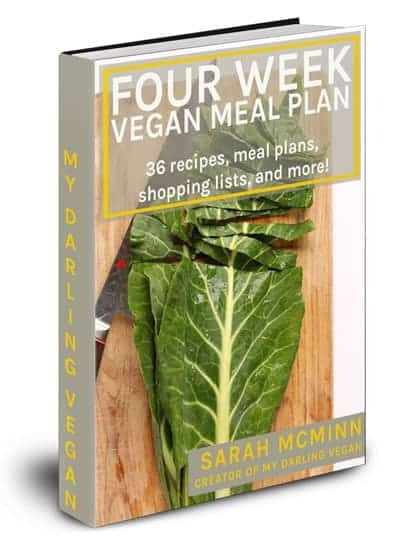 Return to the freezer and store for up to three months. When ready to use, just toss them in your blender with the rest of your smoothie ingredients. This smoothie bowl allows for a lot of variation. 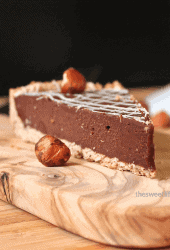 Substitute hazelnuts for any kind of nut, use your favorite non-dairy milk of choice, and top with your favorite toppings. 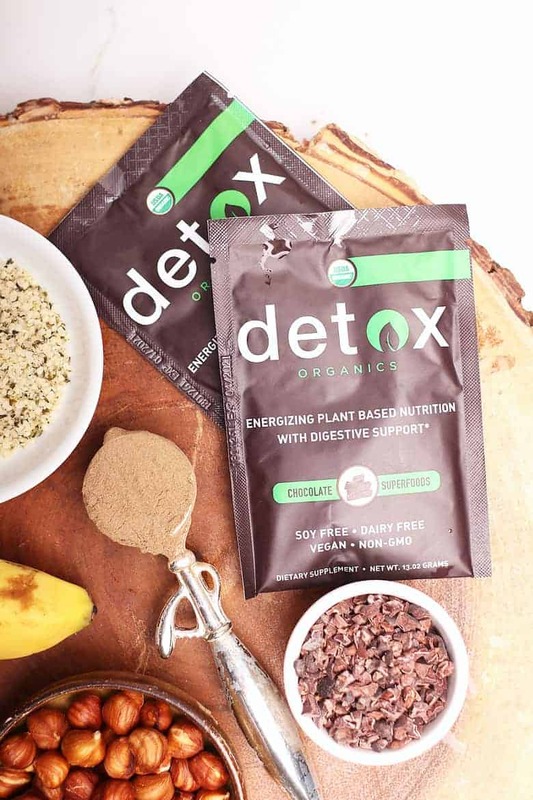 For best results, add 1 scoop or one packet of Detox Organics to this recipe to give it a rich chocolate taste while providing you with all kinds of health benefits. This chocolate smoothie bowl should be eaten immediately! Eat with a spoon or omit the toppings, add another 1/2 cup of milk, and enjoy through a straw! 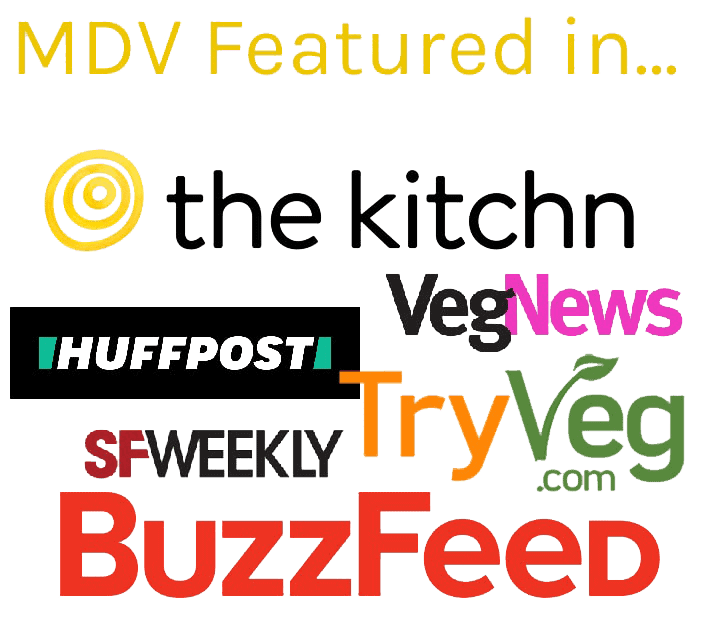 Now, I think you’re ready to give this smoothie bowl a try. Let’s take a look at the recipe card below. 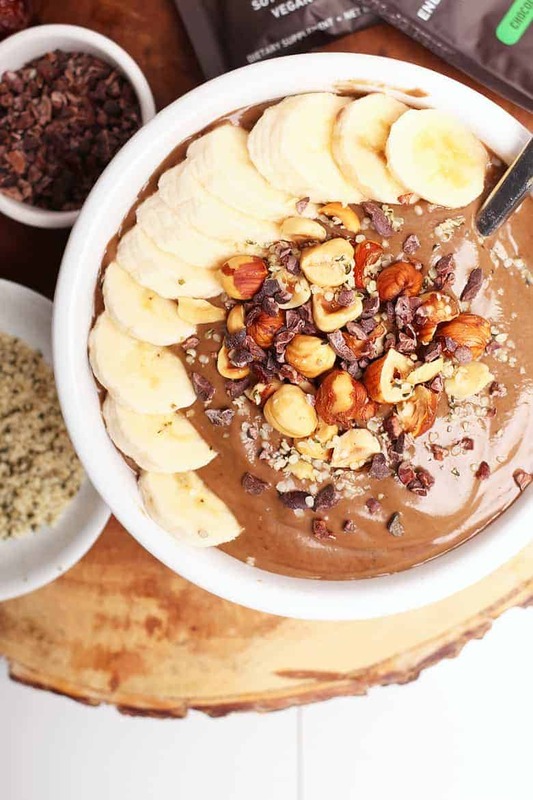 This Hazelnut Chocolate Smoothie Bowl is a wholesome, hearty, and delicious way to start your day. Made in just 5 minutes, it's a smoothie that is packed with fiber, protein, and powerful superfoods for a meal that will fuel you up for hours. Drain and rinse the hazelnuts. In a high-powered blender, blend together all the smoothie ingredients until completely smooth. To start, use only 1/4 cup of milk. Add more if necessary but try and keep the smoothie as thick as possible. You want a soft-serve ice cream like consistency.